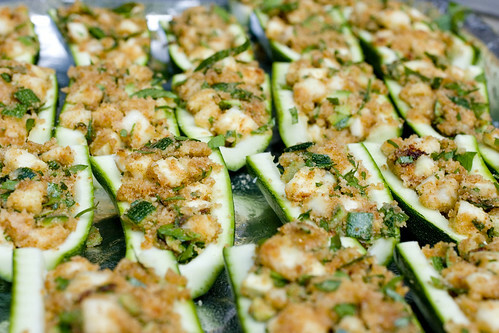 Lon and I fell in love with Stuffed Zucchini when his Aunt Heather made some for us last summer. (Click here for pics.) 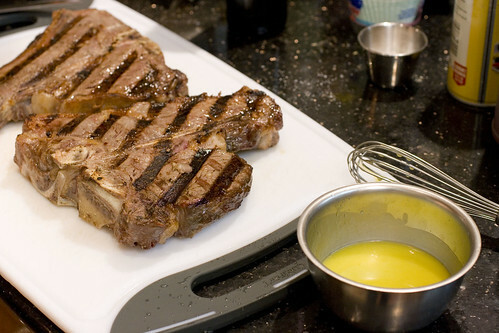 Not knowing the recipe, Lon had to make his own when he had to have it one night. It’s so hard to get Lon to write down his recipes but he did leave me some chicken scratch to start from, which of course I could not read half of. Doing my best to interpret ingredients that looked like “2 T parade” (what? ), I made yet another reincarnation of the recipe so that I could write out a recipe to share. 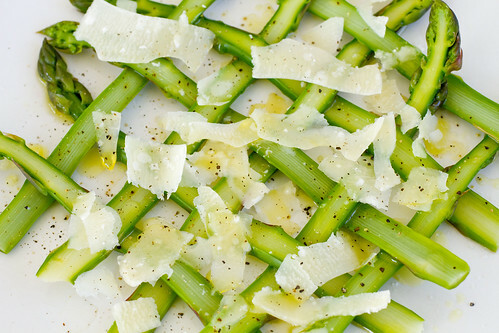 I’ve made this at least three times now because it’s a perfect vegetarian side dish or party appetizer. 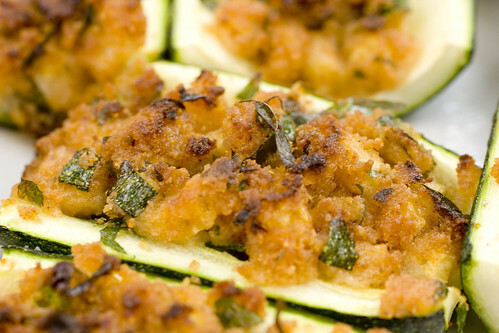 This recipe is easier to follow if you use the same size zucchini I used. Look for ones that are roughly 1 3/4″ to 2″ in diameter. You’ll need 10 segments that are 3″ long each, so you’ll get 2 segments out of one that’s roughly 6″ or three segments out of one that is roughly 9″. 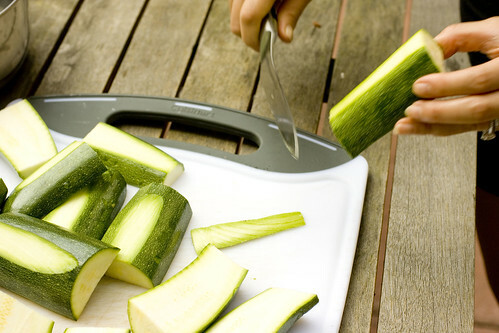 I hope that makes sense…It’s a pain because zucchini vary in size so much. 1. Preheat oven to 350 degrees F. Cover a baking sheet with aluminum foil and spray with non-stick spray. 2. 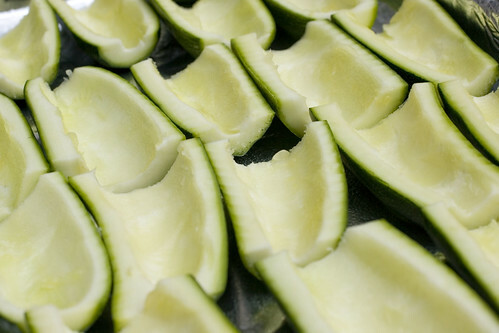 Cut all zucchini segments in half lengthwise. 3. 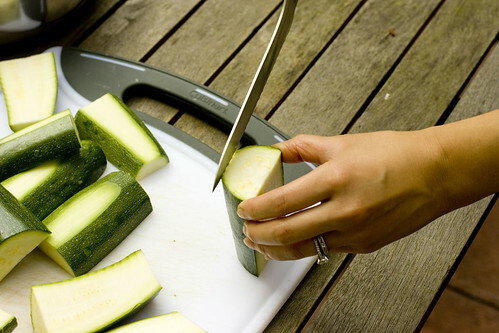 Cut a thin strip off the curved side of each so that it has a flat surface to stand on. This prevents wobbling. Reserve the strip you cut off. 4. 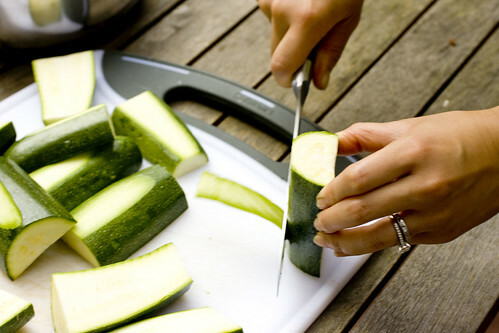 Use a spoon to scoop out the middle of the zucchini. 5. For the flesh you just scooped out, cut off the parts that are seeded. No need to be precise, but you want the solid flesh on the left side of this picture, not the seeded stuff on the right side. 6. 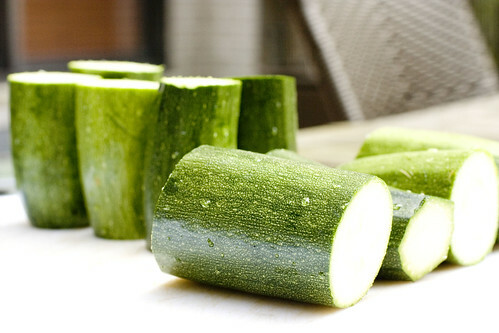 Dice the solid zucchini flesh and the strip you cut off earlier into little cubes (no need to be precise). 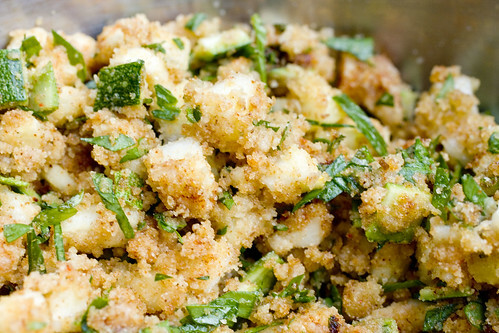 Toss it in a bowl with bread crumbs, parsley, garlic, lemon juice, paprika, and olive oil. Season with 1/2 teaspoon salt and a few pinches of pepper. 7. 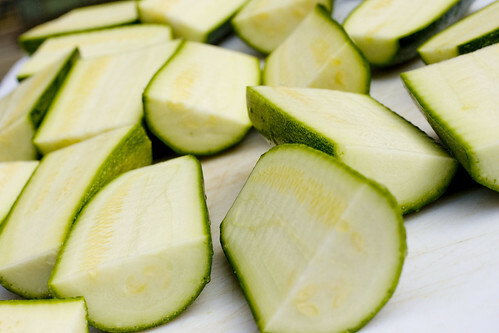 Arrange zucchini on the prepared baking sheet with scooped side up. Sprinkle with salt and pepper. 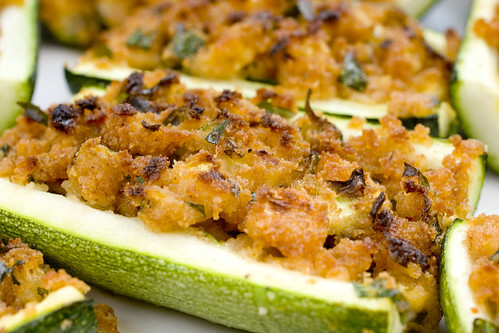 Fill with zucchini bread crumb filling. Pack it down gently. 6. Bake on the top shelf of the oven for 20 minutes. Turn your oven to broil and color just until golden, about 2 minutes. Serve immediately. My friend Tammy is a sweet Southern belle from Baton Rouge, Louisiana. She went home for her little sister’s graduation and brought back some of her dad’s Crawfish Boil, which was amazing! Everything about it exceeded my expectations of crawfish. (You may remember when we made Crawfish Gumbo. 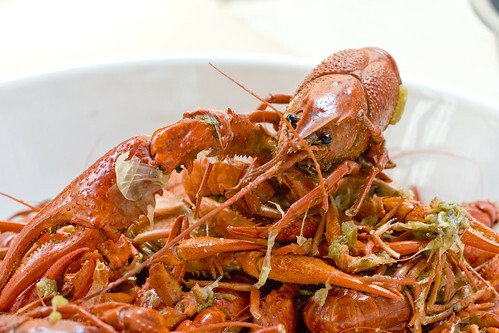 We had a hard time finding crawfish here and what we ended up with wasn’t the best, I guess). One of the best, if not THE best, culinary destinations in the world is Florence, Italy. I had all sorts of wonderful food there from seafood to pasta to meats. Perhaps one of the reasons the local cuisine appeals to me so much is because of how ingredient-focused the dishes are. They keep it simple and use the best ingredients. If the weather is not enough to let you know it’s Fall, the farmer’s market will. 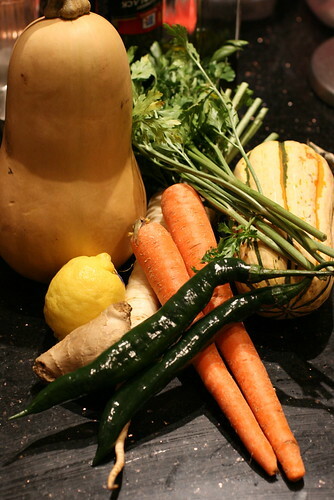 Every other stand has a beautiful selection of fall veggies, including many types of squash. After laughing about how some pumpkins were bigger than Ice (our dog); I picked up a butternut and a delicata. My goal was to make a glowing orange, fall soup that could shine above the rest, something to really get people excited about squash soup. Jessica and I LOVE the finished product. It is perfect, seriously. The spice and fall flavors combine perfectly, this soup will make you feel warmed for the cool weather. While eating it, Jessica said she could imagine herself sitting in a log cabin, by a fire, drinking this soup. 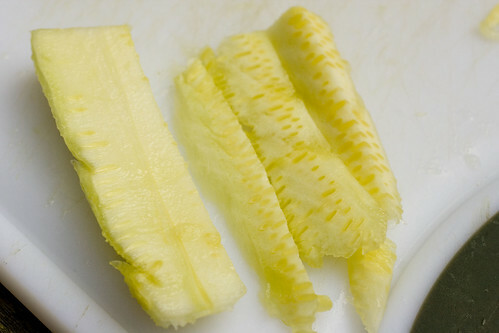 Parsnip Leaves, rinsed and most of stems removed. In Chinatown on Wednesday, Jessica and I picked up a huge pile of mussels and mahogany clams, we’re talking about four pounds here– they were just so cheap, $6 total. Jess had just under a pound for dinner that night, while I went to Devi. So Thursday night we made paella! While there are many wonderful, foreign dishes that can be found in Manhattan, paella is really not one of them. In my experience, most paella in NYC is terrible, and trust me, I’ve searched. If I do discover any decent, digestible dishes, I’ll let you know. In the meantime, I suggest you do as I do, and make your own paella. It’s substantially cheaper than can be bought, although it’s still quite an expensive dinner. I’ve made it at least half a dozen times, and am quite good at it by now. It’s delicious to practice! I’ve included my recipe and below that some notes on ensuring success. Heat olive oil in a paella pan over medium heat. Add in onion, garlic and pepper; cook and stir for a few minutes. Add chorizo sausage, chicken, and rice; cook for 2 to 3 minutes. Stir in 3 1/2 cups stock, wine & vinegar, thyme leaves, and saffron. Season with salt and pepper. Bring to a boil, and simmer for 15 minutes; stir occasionally. Taste the rice, and check to see if it is cooked. If the rice is uncooked (it likely will be), stir in 1/2 cup more stock. Continue cooking, stirring occasionally. Stir in additional stock if necessary, up to 2 cups additional stock, 5 cups total. Cook until rice is done. 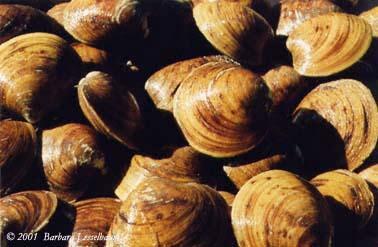 Stir in tomatoes and peas, arrange clams on top. Cook covered for 5 minutes. Stir in squid and arrange remaining seafood on top. Cover and cook for 5 minutes. Uncover and scatter parsley over the food. Serve with lemon garnish (perhaps covered in cheesecloth, stretch wraps ), dust with paprika. Paella should have a complex flavor, developed from the smokiness of chorizo and dusting of paprika constrasted with the brightness of saffron, wine, and lemon. Know your flavors and how to develop them. Paella is traditionally made using arborio rice. However, since it is expensive, rarely used, and difficult to work with, I prefer short grain rice (I also have a bucket around). Arborio is starchier, so to get the same texture, just work the short grain rice frequently and use more liquid than you normally would. As you can tell from the directions, paella is cooked in successive layers of flavors. Use these as guides for how frequently to stir. In the beginning you can not over stir and at the end you can not under stir. In other words, stir frequently at the beginning and slow down with each step. By the end, when you’re adding seafood, do not stir AT ALL. Plate with plenty of rice, seafood, lemon and paprika.